IWAKI dosing cabinets makes handling of chemicals more safe and is amongst other used in connection with water treatment plants. Compared to dosing panels the cabinets are sealed solutions. The IWAKI Nordic standard dosing cabinets are in black PE and can be delivered with transparent doors (with or with out lock). This ensures full visibility and free access for inspection and maintenance. 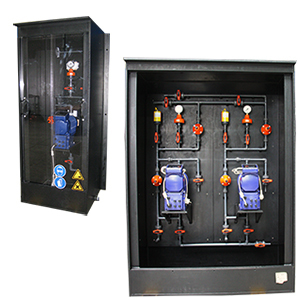 The cabinets can be delivered with several optional components such as: pulsation dampener, pressure gauge, level switch, safety valve, vacuum pump, calibration meter and filters. We also offer customized solutions for the more specialized tasks.